Clinching 20 medals, SAI SAG Kargil lifted 10th District Kargil Taekwondo Championship 2018 trophy on November 23In which over 100 players from all over Kargil participated. The 10th District Kargil Taekwondo Championship 2018 was organised by Kargil Taekwondo Association under the aegis of J&K Taekwondo Association. 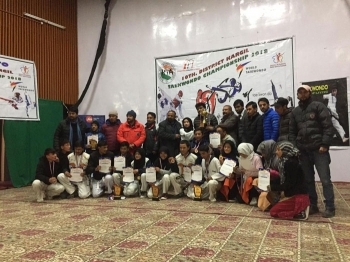 Feroz Ahmad Khan, CEC Kargil, chief guest appreciated the efforts of Kargil Taekwondo Association for grooming young interested youths into professional players since 1998. He expressed optimism that the local players who have immense talent and aptitude for martial arts particularly Taekwondo, despite having limited resources, have the potential to bring laurels to the district at state, national and international level. Reiterating the commitment of the Hill Council Kargil towards the encouragement of youngsters in different fields, he assured Kargil Taekwondo Association for all support to ensure that the aspiring Taekwondo players are groomed in the best possible manner. He further added that Taekwondo is one such game in which players from the district have shown their calibre at the national and international arena. Nasir Hussain Munshi, EC Works said that Kargil is proud to have 50 Black Belt in Taekwondo and hundreds of players having medals in national events. He said that the Council will do its best to tap the talent of young players by ensuring appropriate platform and encouragement. Lifetime achievement award was conferred to Gulzar Ahmed Mir, Senior NCC Instructor, and Sports Promoter. Also, medals, trophies, and mementoes were distributed among the players and teams. Professor Nasir Hussain Shabani, Muhammad Ali Tak, Assistant Director Information Kargil, Gulzar Hussain Munshi, President Kargil Taekwondo Association and Ajaz Hussain Munshi, Social and Cultural Activist were also present.